Arthur Streeton writing on 4 December 1926 from Willaura, a sheep farm owned by his friend Walter Cain, near Mount William at the southern end of the Grampians mountain range in Victoria. There are three versions of Land of the Golden Fleece. A flock of sheep grazing near a blue pond, a windmill, and groups of eucalypt trees lead the eye to Mt William rising in the distance. Shadows move across the land and the use of colour gives the image a sense of space. 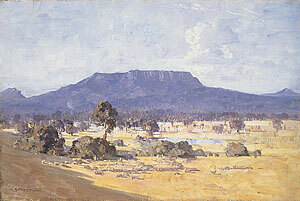 The blues and greys of the distant Grampians recede, while the warm yellows in the foreground to make the golden fields appear closer to the viewer. The Land of the Golden Fleece celebrates a landscape of prosperity and potential, where future generations could dream of greatness. The grand scale and scenic beauty display an open and opulent pastoral paradise, a country rich in earth and water, sky and land. The title of the painting may have been inspired by a series of 32 articles The Land of the Golden Fleece, which were written in 1885 by the English "Prince of Journalists", George Augustus Sala for the Daily Telegraph. This title evokes classical themes and imagines colonists of the Australian bush as heroic.